This afternoon, Sarah called from Fullerton where she works as a personal assistant for her former voice teacher. She had accidentally locked her keys in the car. So she called home and asked for help. Joanna and Jeffrey volunteered to drive the 25 miles (about 40 to 45 minute drive each way) and take her a key. Since the Subaru was getting low on gas, Joanna and Jeffrey stopped at a near-by gas station to get some gas. Since they were heading to Fullerton, we thought that we’d make the extra trip worthwhile by stopping by Papa Murphy’s and picking up some of their “take-and-bake” pizzas. (There aren’t any Papa Murphy’s close to our house.) While they were at the gas station, Nicole found some coupons online. We called Joanna and Jeffrey and they returned home to pick up the coupons. 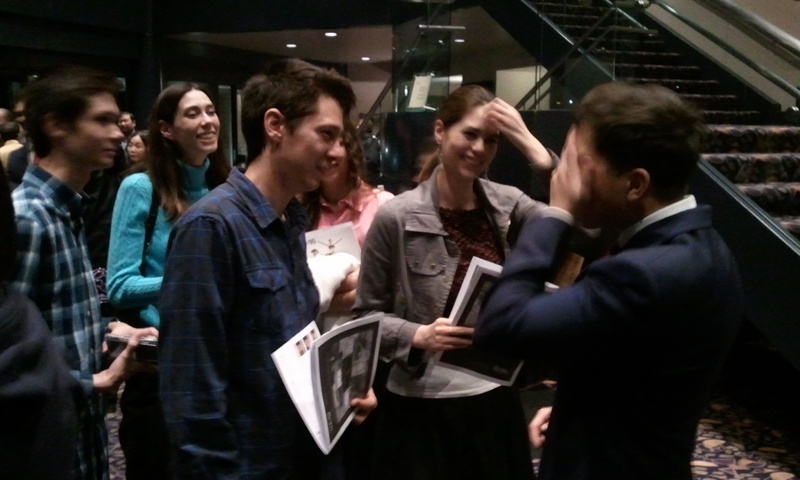 They then made the 45-minute drive to meet up with Sarah. Upon arriving, Joanna asked Jeffrey for the key. Jeffrey quickly realized that he didn’t have the key! He had taken off his jacket when they returned to the house to pick up the coupons. The key was in his coat pocket! As a result, they had to call home. This time, Tim drove the key up to Fullerton. At least, we ended up with pizza out of the deal. A lot of us knew about The Kings Singers from YouTube videos like this one where they sing The Overture from the Barber of Seville. 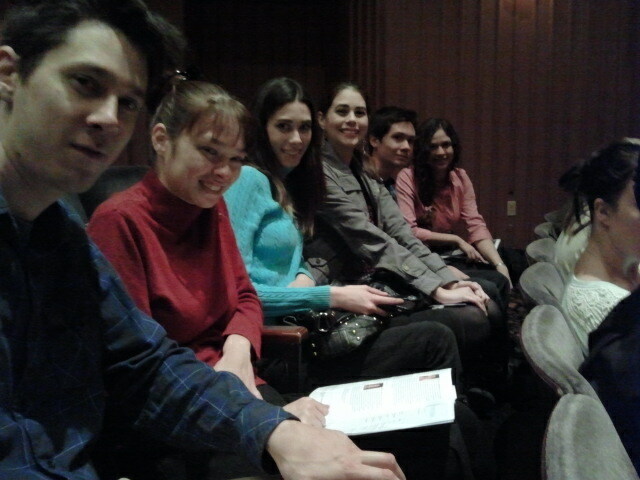 So on Friday night, eight of us went to see them at the nearby Barclay Theater at the University of Irvine. 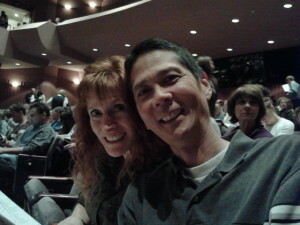 Jeri and Tim Waiting to See The Kings Singers. Click photo for full size. Barclay Theater – Justin, Nicole, Sarah, Joanna, Jeffrey, and Victoria. Click photo for full size. We were all absolutely amazed at their singing ability. 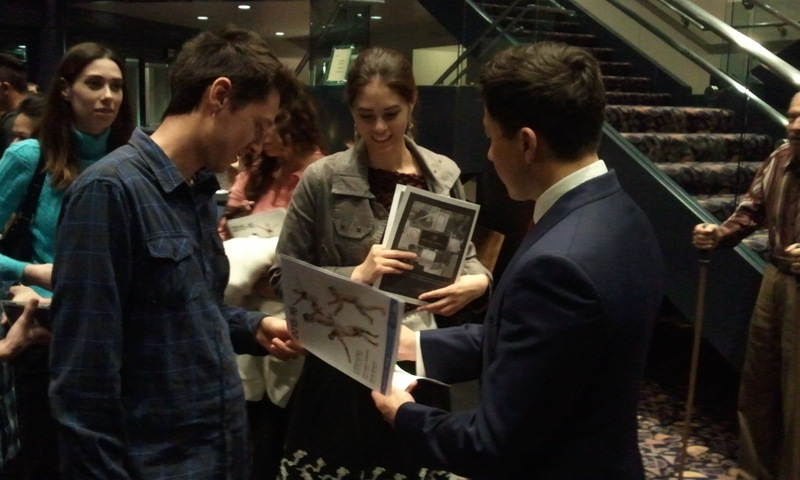 After the concert, all six of the singers came out to meet people. So after buying a few of their CDs, we met each of them and got their autographs. 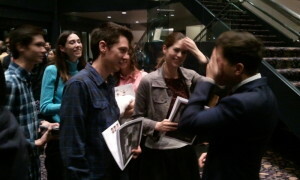 Meeting the Tenor, Julian Gregory. Click photo for full size. 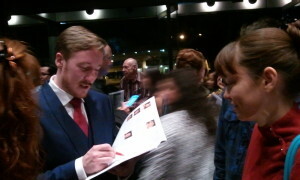 Julian Gregory signing Justin’s program. Click photo for full size. Baritone, Christopher Bruerton, signing a program. Click photo for full size. Here’s a group photo with the bass, Jonathan Howard. L to R: Victoria, Sarah, Tim, Jeri, Joanna, Justin, Jonathan Howard, Jeffrey, and Nicole. Click photo for full size.